This is part 2, a continuation of the post on Big Data Ecosystem for Science. One of the leading sources of data in the genomic space is a sequencer that can extract the DNA sequence from a physical sample. These sequencers can then generate files, typically called “reads,” with the genetic code, along with information about the errors in those measurements. 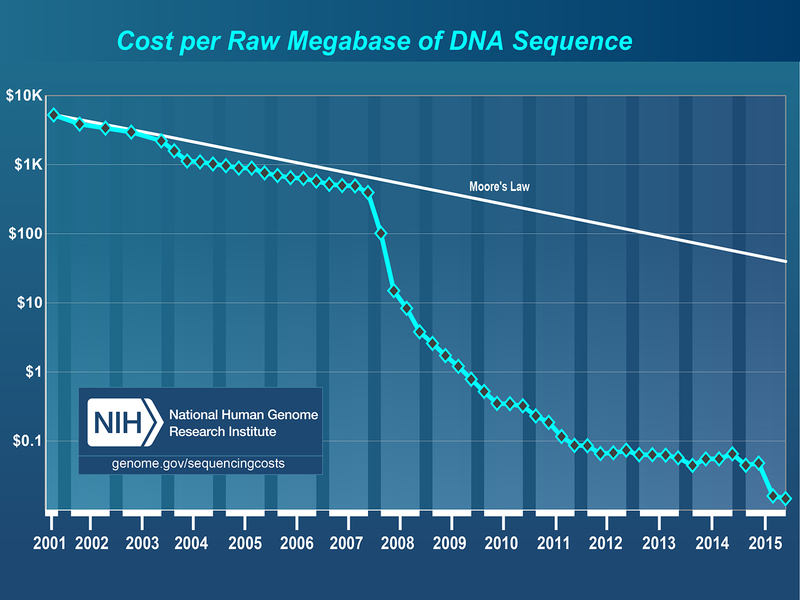 Sequencing costs have dropped by more than five orders of magnitude in a roughly 10-year period (see Figure 4). This dramatic improvement has been primarily enabled by“short-read” sequencing technologies that generate billions of reads in a single run, and are typically hundreds of base pairs in length. In contrast, single-molecule-based technologies provide longer reads, but typically have lower throughput. These technologies can be used to sequence DNA to understand the basic “code” of an organism, but short-read sequencers are increasingly being used to measure protein expression, variation, environmental response, and so on. The scale and types of computational resources required to conduct these analyses also vary. Some analyses, such as assembly, cannot be easily partitioned and are typically run on single large-memory nodes. For example, some large assemblies are run on terabyte memory systems. Other analyses, such as annotation or comparative analysis, can easily be subdivided and run in an “embarrassingly” parallel manner across hundreds or thousands of compute cores (i.e., without communication between the tasks). Traditionally, this type of analysis has been conducted on large workstations or commodity clusters. However, the increasing scale is leading some researchers to explore large high-performance computing (HPC) platforms for their analyses. For example, HipMeris an assembler written in a high-performance parallel language that performs de novo assembly of complex eukaryotic genomes using more than 10,000 cores. Other applications have been ported to run on accelerators and integrated circuits known as field-programmable gate arrays to accelerate specific kernels. The challenge in making this transition from commodity clusters to high-performance platforms is the variety of applications that are used in many workflows and the rapid increase in demand. The raw data or analysis product can be transferred or shared at various stages using a variety of methods. Many web-based tools exist for analysis and sharing, such as KBase, Galaxy, Illumina BaseSpace, and the National Center for Biotechnology Information(NCBI). Transfers are often done using simple web posting, but other methods such as FTP, Globus, and even commercial solutions such as those from Aspera are also commonly used. Many sequencing products are posted to repositories like those run by the NCBI. A large number of sites also exist to support specific domains, organisms, and applications. For example, there are sites that focus on fungi, pathogens, microbes, and even specific organisms like corn or the fruit fly. Bio: Wahid Bhimji is a big data architect in the Data and Analytics Services group at NERSC. His current interests include machine learning, data management, and high-performance computing. He was previously heavily involved in data management for the Large Hadron Collider. Wahid has worked for 15 years in scientific data management and analysis in academia and government and has a Ph.D. in high-energy particle physics. "One of the most valuable events to advance your career."